March 15, 2017 2 comments on "How to Freeze Bell Peppers"
Extra peppers in your garden this year? 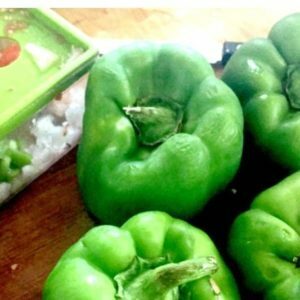 It’s easy to freeze bell peppers so that you will have them all winter long. My garden did really well this year, and I am running out of canning jars! I have been busy freezing my extra tomatoes for this winter, so now it’s time to start working on freezing my bell peppers. There are many ways to use your frozen bell peppers. They are great in soups, casseroles, salsas, and much more. I have found that if they are already chopped, they are even easier to use later because you have already done all the hard work ahead of time! If you have the time you can chop the peppers by hand, but I found this great vegetable chopper on Amazon and I have never looked back. I literally use it ALL the time. When you are chopping a lot of vegetables at one time, you really need some kind of vegetable chopper to make your work easier. I use it especially when making salsa. You can use it to quickly and easily dice tomatoes, onions, and all kinds of peppers. Wash your bell peppers and remove any bad spots, the cores, and seeds with a paring knife. Dice the remainder of the bell peppers to get ready for the freezer. I freeze my peppers in quart sized ziploc bags, but you can also get these great freezer containers from Amazon. I use them all the time when I quickly want to get something in the freezer and they stack really well. If you are going to freeze your peppers in serving or recipe sized portions, then you can just measure how many peppers you want and place them in the ziploc bags to put in the freezer. If you want to be able to use a different amount out of the freezer each time, then first spread the diced peppers on a cookie tray and freeze them so that the pieces are individually frozen. After they are frozen transfer them from the cookie sheet to ziploc freezer bags or freezer containers. Now you should be able to remove some of the peppers from the container without them all being frozen together. If you like you can mix different kinds of peppers and/or onions with your bell peppers, depending on what you are planning on using them for. These frozen peppers will store in the freezer from 6-12 months. 2 Comments on "How to Freeze Bell Peppers"
I understand the freezing part. But any time I have frozen vegetables like this, when they thaw they turn into soggy, and completely broken down. Not anything like it is supposed be. What stops your from this problem? Or is it the same? Hi! They do end up softer than you would sometimes like, but I usually end up cooking them in something that I don’t notice the texture too much. If you are just using ziploc bags to freeze the bell peppers in, you might try using something like a Seal a Meal that removes all the air from the bags. I think some of the sogginess is coming from ice building up in the bags if they are in the freezer too long.